After a battle with the wireless router for a couple of weeks. We are set! YAY!!! No more wires laying across the table, floor, etc. I'm happy to be able to sit on the sofa or lay in the bed at night and surf the web. I wanted to share a picture of a few things that I've picked up at yard sales and thrift stores. Over the past couple of weeks. 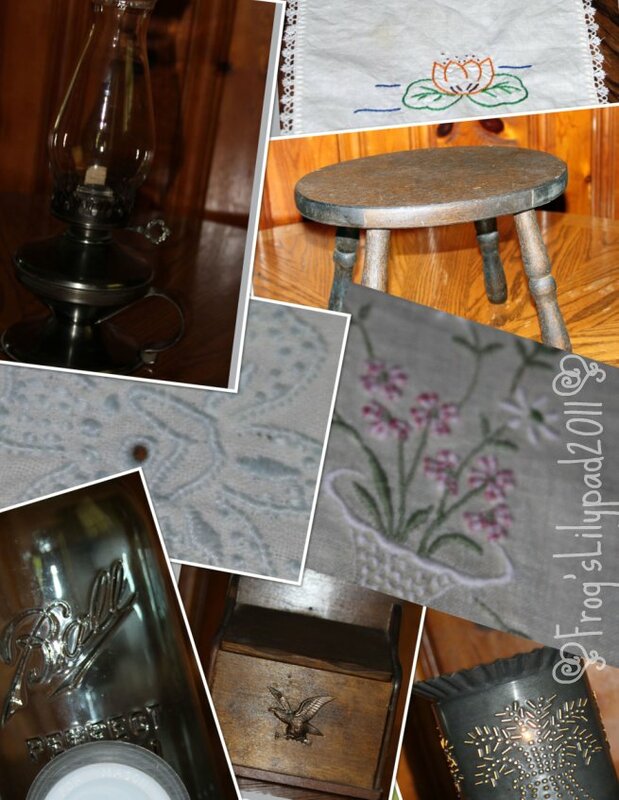 I have two favorites shown ~ The metal oil lamp and the wooden stool. I've put the lamp on the mantle and the stool is on the hearth of the fireplace. I have some old books I have sitting on it. I'm looking for an old piece of leather, to wrap around the books ~ one day. Oh yes, I don't want to forget... Someone told me about Pandora Radio. All you have to do is list the artist, song or type of music and it will pull up that kind of music for you to listen to. I have it on now in another tab and love what I hear. It will even shuffle the "stations" or files so you hear a variety. There are advertisement pop ups but, if you have it in another tab then you'll not see those. I have lots of laundry waiting for me. I'll see you all soon.